The Orioles and Maryland Stadium Authority (MSA) today announced that after a multi-year effort of research and enhancements, the U.S. Green Building Council (USGBC) has awarded Oriole Park at Camden Yards with Leadership in Energy and Environmental Design (LEED) Gold certification for an existing building. Oriole Park joins AT&T Park in San Francisco, Calif., Marlins Park in Miami, Fla., and Target Field in Minneapolis, Minn., as LEED Gold certified ballparks in Major League Baseball. Oriole Park and the accompanying B&O Warehouse, which was awarded with LEED Silver, demonstrate year-round sustainable activities and practices including waste management, recycling, paperless tickets, and reduced energy usage and electrical consumption. More information on the Orioles’ environmentally conscious initiatives, and ways fans and visitors can get involved, can be found at www.orioles.com/gogreen. Throughout the nation and the world, the USGBC help construct new buildings, and improve existing structures in order to be environmentally and socially responsible and healthy, and improve an overall quality of life. LEED is the most widely used and respected green building rating system and standard in the world. The Ballpark That Forever Changed Baseball™ is continuing to trail blaze the world of professional baseball after being awarded the LEED Gold certification, making it the second-highest Major League Baseball stadium (No. 1: Marlins Park – LEED Gold New Construction), and the highest for an existing stadium. As the Orioles join other MLB teams in honoring Earth Day on Sunday, April 22, Oriole Park and the B&O Warehouse will be presented with their respective LEED certifications in a special pregame ceremony with Maryland Lieutenant Governor BOYD RUTHERFORD, representatives from USGBC, the Maryland Stadium Authority, and Paladino and Company, an associated firm who helped with the research and certification process. “On behalf of Governor Hogan, we congratulate the Maryland Stadium Authority in obtaining LEED certifications for Oriole Park and the B&O Warehouse from the U.S. Green Building Council,” said Maryland Lt. Governor Rutherford. “The historic and iconic Oriole Park at Camden Yards, already amongst the best ballpark experiences, is now further enhanced with energy efficient equipment and environmentally conscious improvements. 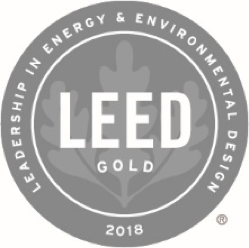 The LEED certification project, fully funded by MSA, supports Maryland's commitment to sustainability, every day, and especially this Earth Day”. Additionally, all Orioles players and coaches will wear green-accented jerseys and caps to celebrate Earth Day as they take on the Cleveland Indians at 1:05 p.m. ET. The game-worn jerseys and caps will be autographed, authenticated, and auctioned online at www.orioles.com/auctions to benefit the Chesapeake Bay Foundation. Images of the Earth Day jerseys and caps are available for download via Photoshelter, courtesy of the Orioles (password: Media 2018). As part of the Birdland Community Heroes program, which recognizes individuals at each weekend home game who have inspired others through their spirited commitment to extend a hand in charity, service, hope and harmony, the Orioles will recognize a volunteer from the Chesapeake Bay Foundation as the Community Hero on Sunday, April 22. The Orioles will also make a $2,500 donation to the Chesapeake Bay Foundation in honor of the hero, as part of a $300,000 pledge the Orioles and the Orioles Charitable Foundation made prior to the 2018 season to honor past and future Birdland Community Heroes.